Assess projects, including those involving multimedia. Projects help students personalize their learning and are ideal for gaining key knowledge and understanding of content and answering the question: Where am I ever going to use this? When project-based learning (PBL) is introduced into classrooms, "Teachers and schools can make use of externally developed PBL curricula, they can develop their own PBL approaches, or PBL can be part of a whole-school reform effort" (Condliffe, Quint, Visher, Bangser, Drohojowska, Saco, & Nelson, 2017, p. iii). Among the greatest benefits of project-based learning (PBL) are gains in students' critical-thinking skills and development of their interpersonal and intrapersonal skills. PBL is also an ideal way to help learners gain speaking and presentation skills indentified in the Common Core Standards. PBL in mathematics, particularly when completed in teams, helps learners "model with mathematics" as they "apply the mathematics they know to solve problems arising in everyday life, society, and the workplace," "use tools strategically," and "construct viable arguments and critique the reasoning of others," as noted in the Common Core Standards (2010) for Mathematical Practice. Additionally, a major shortcoming in many student projects is that educators tend to assign projects just for the sake of doing them (Goodwin, 2010). As Bryan Goodwin found in his literature review on PBL, "Educators can avoid this phenomenon and realize the potential of projects to promote students' critical-thinking by framing projects around a driving question" (2010, p. 81). At PBLWorks from the Buck Institute for Education, you'll find an archived-webinar on Driving Questions for those who need to learn more about their purpose and see examples of their use in various K-12 grades and subjects. This challenging open-ended driving question or problem is just one of the essential elements of meaningful projects, according to John Larmer and John R. Mergendoller (2010) of BIE. 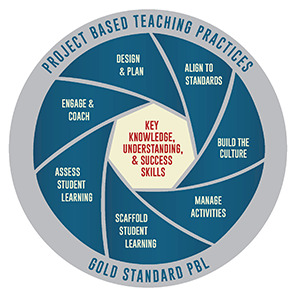 They updated their PBL model in 2014 to what they called a "gold standard" (See their 2015 blog post on why, which is also the source for the image on PBL). Every good project needs significant content, meaning tied to standards so that students gain key knowledge and understanding. Students also need to perceive the work as meaningful to them. A clear connection to an entry event adding this meaning might be via almost anything: "a video, a lively discussion, a guest speaker, a field trip, or a piece of mock correspondence that sets up a scenario" (Larmer & Mergendoller, 2010, p. 35). Students need a voice and choice in fulfilling project requirements, keeping in mind that limited choices be considered and that "teachers should design projects with the extent of student choice that fits their own style and students" (2010, p. 36). Projects should give students opportunities to build 21st century skills (or success skills) and to use technology that will be useful to them in life and the workplace. Projects should enable learners to conduct real inquiry. This has to do with authenticity or how real-world a project is. With "real inquiry comes innovation--a new answer to a driving question, a new product, or an individually generated solution to a problem" (2010, p. 37). Learners should receive feedback to use in revision, as learning that real-world work often involves revision. Outside experts or mentors can also provide input (Larmer & Mergendoller, 2010). Teachers should not be the only ones to provide this feedback. Peer-editing sessions with the aid of appropriate rubrics or checklists can be useful for students to present their rough drafts to each other (Pahomov, 2014). Students should publicly present their work, as they will be more motivated to produce a quality product when knowing a real audience will view it (Larmer & Mergendoller, 2015, 2010). As Larissa Pahomov (2014) pointed out, "Why should students put so much effort into a product that is only going to be viewed by one person?" -- the teacher (p. 92). Although there might be live presentations to share projects, "they should also be designed to stand on their own, after the formal presentation has ended" (p. 87). A venue for presenting completed projects might be "as simple a setting up a gallery in the hallway or a landing page for links to projects" (p. 92). A blog or wiki is ideal for posting online presentations, which elevates projects beyond the school walls. "What makes this process meaningful, however, is when students have been creating their project with a particular audience in mind and then they target that audience once the content has been posted" (p. 98). Projects might be entered into contests and competitions, or presented to real-world professionals for feedback. If projects involve teamwork, educators will need to emphasize commitment to the team as an essential component for success of group work. Larmer (2014) noted that this may not automatically emerge, but a "sense of responsibility to their peers can be one of the most powerful motivating factors for students working on a project in teams" (p. 45). To help support teamwork, teachers might consider "constructing list of norms or a rubric with students; having students write contracts for how they will work together; providing them with tools, such as task planners and online collaboration platforms; and teaching them how to resolve conflicts and make decisions. During a project, have team members frequently check in with one another—and the teacher—to be sure things are going smoothly" (p. 45). Finally, projects should include the element of reflection. Per Larmer and Mergendoller (2015), "students should reflect on what they’re learning, how they’re learning, and what they have accomplished in a project" (Two new elements section). Self-Reflection on Project Work from BIE's PBLWorks is one such template. What do we mean by building 21st century skills? Numerous documents have referred to the need for this or that activity to build 21st century skills needed for career and college readiness. However, what does that mean stated in terms that everyone can easily remember? The National Research Council (2012, p. 2) suggested three broad domains as a way in which to organize competencies--such skills and abilities: cognitive, intrapersonal, and interpersonal. They are intertwined based on human development and learning, however. What might not surprise readers, however, is that "Precise definitions of the many terms used for “21st century skills” are not possible at this time, in part because there is little research to support such definitions" (p. 2). Is the project devoted only to mathematics (or a single subject area), or is there a link to other curricular areas? Is the project tied to standards for the curricular areas addressed, such as those from the National Council of Teachers of Mathematics, the Common Core Standards, or the National Education Technology Standards? Does the project come with classroom instructional materials (e.g., teacher resources, student activities, rubrics and assessment tools)? Can all students in your class participate? Projects should not be reserved for your talented and gifted students, as all students should be able to benefit. What is the total time for project completion? Is the project collaborative in nature? A collaborative project, particularly involving students outside your own school setting, will take more time and monitoring to help students learn how to be a part of a team and communicate appropriately with others. How will students benefit both academically and personally from their involvement in the project? Consider that when students interact with other students and experts across the country or internationally, they get a broader feel for diversity. Their participation in an actual real world activity might encourage them to do their best work, and see the relevance of mathematics in their daily lives. If students have input into project selection, and like the topic, they will tend to become more involved and excited about their learning. Is there a cost involved to participate? Don't forget the home-school connection! If you decide to engage in a project of significance to your learners, parents would appreciate knowing about it. Consider sending parents a letter to explain PBL, the nature of the project, how learners will be assessed, and what they can do to help. BIE's PBLWorks has a Template for a Letter to Parents. Help learners reach project milestones by recording oral feedback along the way using tools such as Screencast-O-Matic. Adding to the above, educators need to decide on what they mean by project-based learning (PBL) and which model is needed. In World Class Learners: Educating Creative and Entrepreneurial Students , Yong Zhao noted three forms of PBL, according to J. Robinson (2013): an academic model, a mixed model, and an entrepreneurial model. In an academic model, all elements are controlled by the teacher. The goal is to teach prescribed content and skills. Products are not meant for authentic consumption. In a mixed model of PBL, the artifacts students create (sometimes for consumers outside of school) and prescribed content are valued. Still under the control of the teacher, students have a degree of freedom within the project. The focus is more on learning real world skills, rather than transmitting knowledge. Both of these latter models are about teaching the curriculum. Michael Stone (Schwartz, 2016) provided the following tips for success to guide the methodology. Make projects explicitly tied to standards. This helps justify the time investment. Balance clear expectations with open-ended problems. Stone indicated, "the strength of a project depends heavily on the initial driving question developed by the teacher." The rubric should be clear about expectations and designed around the driving question. Assess process alongside content. Per Stone, process-oriented goals "like collaboration, critical thinking, communication and innovation" should be included on the rubric "alongside the specific content goals." This demonstrates their equal importance. Students should document the development of their projects to illustrate their role in achieving process goals. Anticipate the skills and design scaffolds. "In addition to thinking through the driving question and the learning standards students would need to answer that question, the teacher also thinks ahead about the likely gaps in skills students are going to have both in content and process." Scaffold categories might include whole class activities, station activities, workshops, and focus groups. Transfer accountability to students. Consider using contracts--"students make contracts with one another about how each member of a group is expected to participate, and students set the consequences for failure to do so." To illustrate, Stone indicated students have assigned detentions or reduced final project grades when others did not meet the terms of the contract. In order to tie projects to math standards, Andrew Miller (2011) suggested that teachers need to pick or make an appropriate time for projects (e.g., during a three-week unit on a specific math learning target). Pick a standard with an easy real-life application. These resources are for those who need to know more before engaging in projects and inquiry-based learning. Designing Learning is a section within the Galileo Educational Network Association, which includes a series on the nature of inquiry-based learning. Learn about what inquiry is all about, choosing a topic, essential questions, inquiry and assessment, and then go to the section for Classroom Examples of projects for elementary, middle, and secondary students and a rubric for assessing inquiry projects. Krauss, J., & Boss, S. (2013). Thinking Through Project-Based Learning: Guiding Deeper Inquiry provides an overview of PBL including findings on brain development and connections to Common Core Standards; numerous how-tos and sample projects for K-12; strategies for integrating PBL into main subject areas, across disciplines (science, social studies, language arts, math), and with technology and social media; ideas to involve the community and showcasing student work. PBL-Online has all the resources you need to design and manage high quality projects for middle and high school students. You can learn how to design your own project, what project based learning is all about, search for projects developed by others or contribute your own, review research on PBL, and access other web resources on the topic. PBL-Online was created under the leadership of the Buck Institute of Education, with major contributions from the George Lucas Foundation and others. PBLWorks from the Buck Institute for Education (BIE) has an overview of project based learning (PBL), plus numerous resources for conducting PBL. Educators desiring to implement PBL will benefit from Setting the Standard for Project Based Learning (2015) by John Larmer, John Mergendoller, and Suzie Boss of the BIE. They provide the step-by-step method to create, implement, and assess PBL in classrooms, systemwide, and in informal settings. Sample projects in various grade levels and subject areas are included. ASCD published this book. HOT: Project-Based Learning: A Resource for Instructors and Program Coordinators from the National Academy Foundation and Pearson Foundation provides comprehensive coverage on this topic. You'll find a definition of PBL, questions to consider for when to use PBL, conditions and research supporting PBL, PBL examples and links to resources and training. Commentary on PBL includes: "The best projects skillfully weave together opportunities for students to engage in classroom activities (Level 1) that address content standards (Level 2) while encouraging them to develop habits of mind (Level 3) and the ability to take responsibility of their own learning (Level 4)" (p. 12). The 6 A's of PBL are addressed: Authenticity, Academic Rigor, Adult Connections, Active Exploration, Applied Learning, and Assessment Practices. Finally, within Project Delivery you'll learn about the scaffolding that teachers must consider when implementing sophisticated projects in their classrooms. Project-Based Learning Professional Development Guide at Edutopia.org from the George Lucas Educational Foundation can be used as a two- to three- hour learning module, or expanded to day-long workshops. Find out what project based learning is, why it is important, how it works, and get some supporting resources. Also see Edutopia's Project-Based Learning section. Project Based Learning explained by Common Craft is a short video with an easy explanation of PBL. Project Approach to Teaching and Learning in school addresses the foundation theory for using projects, strategic planning, and project development structure. This is an award winning site by Sylvia Chard of the University of Alberta, Canada. You might also be interested in the interview of Dr. Chard addressing project-based learning, which is available from Edutopia of the George Lucas Educational Foundation. In Using the Internet to Promote Inquiry-Based Learning, authors D. Jakes, M. Pennington, and H. Knodle describe a structured approach to inquiry-based learning that uses the World Wide Web. They address an intuitive 8-step process that begins with an essential question and ends with a knowledge product produced by students, typically completed in a cooperative setting. They discuss the skills that students and teachers require to make inquiry-based learning and the Internet a successful endeavor; and the components of a Project Page, which include the scenario, task, resources, product students will build, and assessment. What is Project-Based Learning? is a video tutorial from New Tech Network, which provides an in-depth overview of this method. Related videos are also available. Teaching the Common Core Math Standards with Hands-On Activities, Grades 6-8 by Judith, Gary, and Erin Muschla (2012) has over 100 activities correlated to the CCSS math standards. Hands-On Math Projects With Real-Life Applications: Grades 6-12 by Judith and Gary Muschla (2006) contains 60 math projects. Math Projects: 50 Hands-On Projects that Correlate to Specific Math Concepts, Grades 5-8+ (2011) by Joyce Stulgis-Blalock is aligned to Common Core and NCTM standards. MathART Projects and Activities (Grades 3-5) by Carolyn Brunetto contains dozens of projects within standards for geometry, number & computation, measurement, patterns, statistics, fractions. You can also find them by season and holiday. Tips for success are included. Do you need tips on getting started? If you are planning your own project, CT4ME provides an essay on project development phases and tips at our page Technology Integration: Multimedia in Projects: About Multimedia and Project Development. If you decide to allow your learners to design their own projects in which they will need to use internet resources, read Patricia Deubel's article, Conducting Research-based Projects in Elementary Grades with Safety in Mind, published July 26, 2017 in T.H.E. Journal. Do you need project ideas? What is the optimum packaging? How do we optimize school bus traffic? Applied Math Science Fair Projects posted at Education.com included illustrative images of projects and is searchable by grade level. You can then download the project. Math Project Ideas: Examples of Project-Based Learning, posted by EdTecher Heidi Reina at HubPages, includes an extensive collection of engaging projects for all grade levels from general math to money and finance, algebra, geometry, pre-calculus, calculus. Many have cross-curricular connections. Origami Resource Center includes project ideas and resources on this topic. It's easy to connect origami, the art of paper folding, to math and geometry, in particular. If you think the idea is just for elementary students, view The Origami Revolution (2017, about 50 minutes) from PBS.org. You'll learn how "engineers and designers are applying its principles to reshape the world around us—and even within us, designing new drugs, micro-robots, and future space missions" (Program description section). Do your learners know what tools to use to design their own math project? There are multiple tools in a variety of categories on the Web for project-based learning activities. Certainly, to help them get started, learners will benefit from a list of resources that you anticipate they will need. Deal (2009) included specific examples within categories such as collaboration suites, course management systems, dedicated project management tools, wikis, web-conferencing tools for real-time communications, collaborative concept mapping tools, presentation and slide sharing tools, online collaborative writing tools, and task management tools. The choice would depend on the objectives of the assignment and whether or not the project is to be completed by individual learners or collaboratively within groups. Bubble.us is a free web application that allows groups to brainstorm online and create mind maps. You can embed the map in a blog or website, or save the mind map as an image. This is a great way to start projects. ClockingIT provides free space for project management, collaboration, and time and task management. Glogster EDU provides a secure space online for educators and their learners to have an outlet for their creative posters or glogs. A glog is a virtual online poster that incorporates multimedia. In addition to text, learners can embed images, audio, video and hyperlinks. Posters are great projects for students to illustrate what they have learned. You'll find many examples of student glogs for math at this site to give you ideas. The site is free. Wikispaces for Education enables free, private, and secure collaborative group work in classrooms. Infographics templates--15 free templates from Hubspot.com, including how to make an infographic. Infographics as a Creative Assessment from Kathy Shrock includes a list of multiple tools for creating infographics, samples, a general overview of this topic, and more. Little Bits--build STEM and STEAM skills with electronic building blocks. Makey Makey--an invention kit. "Turn everyday objects into touchpads and combine them with the internet." Scratch--a programming language for kids (ages 8 to 16) to create stories, games, and animations, which was developed by MIT. It is free. Note: Members of the ScratchEd research team at the Harvard Graduate School of Education developed a free guide, Creative Computing: An Introductory Computing Curriculum for Scratch. The version for educators includes plans, activities, and strategies for using Scratch and the workbook version for learners has activities and reflection question templates. Tickle--free app in iTunes for this drag-and-drop programming language, that can also teach kids to code. "Learn to program Arduino, drones, robots, connected toys, and smart phone devices, all wirelessly." Create games and interactive stories with a library of animated characters and sounds. TinyTap is free and allows you to play and create interactive games, lessons, and quizzes. Download it for iPad and Android devices, or for play on your desktop. Tynker--Kids ages 7 and up learn to code with this programming language. Build an app (e.g., games), control a drone, program a robot. Self-paced beginner, intermediate and advanced courses are also available (not free), which include core concepts: "coding fundamentals, animation, conditional logic, patterns, coordinates, angles and direction, variables, functions, physics, gravity." Pricing options are available, including school pricing. Group Project Tools from Carnegie Mellon include team contracts, team roles, self assessments, peer assessments, and group assessments. What is a real WebQuest? Consider a WebQuest, an inquiry-oriented activity in which most or all of the information used by learners is drawn from the Web. Math WebQuests help students to develop reasoning and critical thinking skills, as advocated in the process standards of the NCTM Goals 2000.
participation in a group process that transforms newly acquired information into a more sophisticated understanding. Some activities may be designed to use Internet resources to produce a product, but can't be classified as WebQuests. These non-Webquest activities are those that enable learners to gather information that can go from a browser directly to a product without altering or involving students' understanding, and reflection on their own metacognitive processes. To assess the real value of a WebQuest, ask "Is this WebQuest real, rich, and relevant?" Creating a WebQuest: It's Easier Than You Think! from Education World. WebQuest.org training materials. This site is maintained by Bernie Dodge, who with Tom March developed this model at San Diego State University in 1995. WebQuest 101 from TeachersFirst.com will help you get started. WebQuest Template from Cape Breton-Victoria, Regional School Board, Education Centre. Includes directions within the sections: Introduction, Task, Process, Evaluation (Rubric design), and Conclusion. HOT: Zunal WebQuest Maker is free web-based software for creating WebQuests in a short time without writing any HTML codes." The site includes 100 templates. You can include unlimited files and pictures, embed video, add a pre-test and post-test, create a quiz, add a table/rubric, and more. A bonus is shared webquests in multiple content areas to use or give ideas for designing your own webquest. Assessment plays a key role in PBL. If the nature of your project is collaborative, Ashley Deal (2009) noted that three areas can be assessed. "Instructors can evaluate the process students use in approaching a given problem and finding solutions; they can assess the final product or end result of the project; or they can evaluate the individual student’s learning outcomes" (p. 4). However, a single approach to assessment of group work poses a problem, as "a satisfactory final product does not necessarily indicate that students approached the problem according to the preferred process. Similarly, even using the correct process to arrive at a satisfactory final product does not indicate that individual students grasped relevant concepts" (p. 4). So, more than one level of assessment is recommended. Process: "Evaluating a group’s process can help instructors assess procedural and contextual learning. Procedural learning refers to students’ understanding of how to execute some task, while contextual learning describes students’ ability to discern what contexts require the application of given tools or concepts" (Deal, 2009, p. 5). Product: "[A]ssessing the product or outcomes from student work can provide an opportunity to gather information about advancements in student’s metacognitive learning. For example, instructors can ask for reflection on the overall experience and process when students are presenting the final product" (Deal, 2009, p. 5). Learning Outcomes: Learning outcomes (e.g., declarative and conceptual knowledge) might be assessed via traditional forms such as short answer and essay questions (Deal, 2009, p. 5). Susan Brookhart (2013a) provided valuable advice in Grading and Group Work: How do I assess individual learning when students work together? noting the struggle that many teachers have between the need for learners to engage in cooperative learning and the need to provide individual grades. "Many teachers use group work in the general sense, assigning students to collaborate in groups that result in one undifferentiated product. But true cooperative learning requires individual accountability. No matter what kind of cooperative learning or group work you employ, it is important not to give group grades" (Does group work have to mean group grades? section). She further explains what's wrong with group grades and grading cooperative work versus group work. She answers: How can I assess learning and process skills? How can I assess and grade individual students' achievement? How can I adapt group projects to enable individual grading? Mary Allen (2003) noted that rubrics can be used to evaluate the quality of “virtually any product or behavior, such as essays, research reports, portfolios, works of art, recitals, oral presentations, performances, and group activities. Judgments can be self-assessments by students; or judgments can be made by others, such as faculty, other students, or field-work supervisors. Rubrics can be used to provide formative feedback to students, to grade students, and/or to assess programs” (para. 1). Essential features include "evaluative criteria, quality definitions, and a scoring strategy" (Popham, 1997, Rudiments section). There are three common types of rubrics: analytic, developmental, and holistic. An analytic rubric is often designed in column format with multiple performance criteria listed in the first column and the quality indicator levels, which vary on a continuum, listed in the first row across remaining columns. Each quality level might contain one point value or a range of points that can be assigned. Each criteria might also be accompanied by a comment space for additional feedback on the element. Cells within the rubric might be blank or contain elaborations of each performance criteria for the specific quality level. The developmental rubric is a subset of the analytic rubric and is based on a theory of development. It is useful when the goal is to determine a level of development (e.g., of a skill, value, ability, etc.) rather than the quality of a final product. When using a holistic rubric, a single score (e.g., from 1-4 points on a scale, or 1-6 points on a scale) is assigned based on the overall quality of work in consideration of all criteria. The evaluator matches the student's work to a single description of it. For example, ratings might be above average, sufficient, developing, needs improvement with elaborations on criteria for selecting each (DePaul University, Teaching Commons, Types of Rubrics, n.d.). Students benefit from access to a rubric while they are working on a project. Knowing the criteria on which they will be assessed is a plus to help them develop, evaluate and tweak their own work prior to submitting it. Rubrics are valued because they enable objectivity in assessment. However, when educators design their own rubric or select an existing one, they need to consider the potential increase in cognitive load it might present when actually using it. The greater the number of criteria and granularity within quality levels, the longer it takes to apply the rubric for one project. Ranges of point values within a quality level also add a degree of subjectivity to using the rubric. Then consider the number of projects to be assessed. Per Popham (1997), if a rubric is to be instructionally useful, its length makes a difference. Teachers will avoid using overly detailed rubrics, particularly for routine tasks. Rubrics that include quality indicators requiring evaluators to count errors before assigning a point-value also increase cognitive load and require a level of granularity in grading that not all educators are willing or even able to do. Of course, this would depend on the objective of the assignment or project. Scores derived from a rubric might also be affected by terms within quality levels that might be understood differently among evaluators who use the rubric. Quality elements that differ by only a word or two are particularly challenging to use. For example, consider quality levels such as: … is not stated, … is stated, …. is clearly stated, … is clearly and concisely stated. Rubrics might also pose a challenge if the numeric score obtained from it will be translated into letter-grades. Learn how to create rubrics to help measure quality and student performance on projects with these additional resources. Or, use an existing rubric. How to Create and Use Rubrics for Formative Assessment and Grading by Susan Brookhart (2013b) includes two sections. In Section 1, Brookhart lays out the basics of rubrics, explains their importance, discusses common misconceptions, and how to write or select effective rubrics. She identifies various kinds of rubrics and their essential components. In Section 2, she explains how to use rubrics for formative assessment and grading. RubiStar from 4teachers.org is a free tool for teachers to create rubrics for projects. Rubrics for Assessment from University of Wisconsin-Stout: video and multimedia production, podcasts, web page and ePortfolios, math, oral presentations, and more. Teach-nology's Rubric Makers allow you to make grading rubrics by filling out a simple form. The materials are made instantly and can be printed directly from your computer. You can also customize your own rubric. Rubrics of interest include homework, class participation, math projects, oral presentations, WebQuests, team work, writing, research reports, and reading. Student Checklist and Judges' Rubric from Multimedia Mania, which is an annual award program sponsored by ISTE HyperSig. Help your students to understand the beauty of mathematics found in nature and everyday life. Often students have difficulty seeing the math that is around them everyday or they lack motivation for studying mathematics because they don't see the connection of it to everyday life. One way to help them is to show them the beauty of math found in nature and in everyday life. Another is to listen to the variety of TED Talks on the Topic of Math from experts around the world, which is sure to capture the interest of your learners. Many of these can also provide great topics for projects. "Join NOVA on a mathematical mystery tour—a provocative exploration of math's astonishing power across the centuries. We discover math's signature in the swirl of a nautilus shell, the whirlpool of a galaxy, and the spiral in the center of a sunflower. Math was essential to everything from the first wireless radio transmissions to the prediction and discovery of the Higgs boson and the successful landing of rovers on Mars. Astrophysicist and writer Mario Livio, along with a colorful cast of mathematicians, physicists, and engineers, follow math from Pythagoras to Einstein and beyond. It all leads to the ultimate riddle: Is math a human invention or the discovery of the language of the universe?" 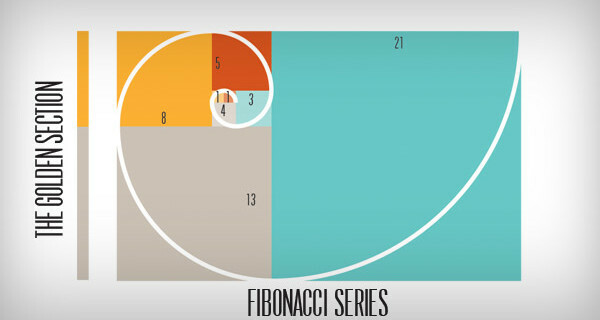 The image of the Fibonacci series shown is from Flawlesslayout.com within a post called Flawless Layout Logo, the Golden section proportion and the Fibonacci series formula where you'll find more images of the golden section in nature. Dr. Ron Knott's web site contains more on Fibonacci numbers and the Golden Section in nature. You will also find activities to do with your learners. Note: The Fibonacci numbers are 0, 1, 1, 2, 3, 5, 8, 13, ... (add the last two to get the next). Who was Fibonacci? Fibonacci or Leonardo of Pisa lived from 1170-1250. Read a "brief biographical sketch of Fibonacci, his life, times and mathematical achievements." Golden Ratio is about 1.618 and is given the Greek symbol Phi (φ). Math is Fun provides learners with an easy to understand explanation of the Golden Ratio, the Golden Section, and Fibonacci numbers. Learn more about the golden ratio at GoldenNumber.net and see where it is used in everyday applications. Omnicalculator.com has multiple calculators. Use the Golden Ratio Calculator to find two lengths that would compute to give the golden ratio. Use the Golden Rectangle Calculator to input one side of the rectangle and automatically see the length of the adjacent side and area of the rectangle that forms a golden rectangle, one whose sides are in the golden ratio. The Exploratorium in San Francisco features the Geometry Playground, which will change how you view geometry in nature. It contains three sections: The Geometry of Seeing with a photo exhibition of the invisible geometry of light; The Geometry of Moving on the arcs, angles, and shapes created when people and things are in motion; and the Geometry of Fitting Things Together. Each includes hands-on activities for grades K-8. The Geometry Garden features curiosities found in nature from crystals to seashells to sculptures. The site was made possible by the National Science Foundation and the Gordon and Betty Moore Foundation. Imagery: A Key to Understanding Math by Holly Korbey at Mindshift (2013, October 31) is a quick eye-opener to helping students find the beauty in math and overcome math anxiety. It leads one to a valuable book by Michael Schneider (1994) on the topic: A Beginner's Guide to Constructing the Universe: Mathematical Archetypes of Nature, Art, and Science . Schneider focuses on the numbers 1-10 and provides a fascinating historical discussion of their relationship to geometry found in nature, art, science, architecture, and so on over time. Using a compass, straightedge, and pencil he demonstrates how you can introduce this beauty to your learners. For example, "ancient philosophers conceived that the Monad [The First] ... creates all subsequent numbers (11111111 x 11111111 = 12345678987654321)" (p. 3). And the circle "represents a wonderful first glymph into nature's alphabet" (p. 4). The PBS television series , NOVA, has a one-hour program about fractals called Hunting the Hidden Dimension. There are five chapters, which can be viewed separately. Learn about fractals in nature, including those in the human body. There are links and books, a teacher's guide, and an email newsletter for learning more. You can also design your own fractal using NOVA's interactive generator. Explore fractals with this unit by Cynthia Lanius, which is appropriate for elementary and middle schools learners and even adults. You will learn about the importance of fractals, properties of fractals, create a few, and get a series of links to other sites on the Web that address this topic. NCTM Illuminations Fractal Tool applet, designed mainly for middle school learners, is a virtual manipulative to see how various shapes are fractals. Users can play with shapes that grow, shrink, and change over several stages and explore self-similarity and patterns in fractal measurements. Amazing Seattle Fractals! will benefit high school learners and above. The developer provides tutorials to learn more about fractals and how to create fractal art. Users can download free fractal software programs and view some fractal art galleries. If you wish to generate 2D or 3D fractals and those with animation, consider ChaosPro, which is freeware for MS Windows. It includes tutorials and a gallery of examples. Pomegranate Software offers the program called Fractals, which is designed for use on iPad, iPhone, and iPod Touch. It “renders as you move and pinch to explore Mandelbrot and Julia set fractals in real-time.” See the exciting displays and learn more about fractals at this site. Fractals are explored in Wikipedia. Brookhart, S. (2013a). Grading and group work: How do I assess individual learning when students work together? Alexandria, VA: ASCD. Brookhart, S. (2013b). How to create and use rubrics for formative assessment and grading. Alexandria, VA: ASCD. Larmer, J. (2014). Boosting the power of projects. Educational Leadership, 72(1), 43-46. March, T. (2003). The learning power of webquests. Educational Leadership, 61(4), 42-47. Pahomov, L. (2014). Authentic learning in the digital age. Alexandria, VA: ASCD.